Cookbooks are often more than thematic collections of recipes. They can be instruction manuals, restaurant marketing tools, encyclopedic references, science or scholarly meditations, chef memoirs, and, as is the case with Feed, tools for activism. “Resistance cookbooks were often a way to amplify things that were already going on,” Turshen notes. One could fill a library with cookbooks that have had a progressive agenda. At least seven suffrage-themed cookbooks would be printed before American women earned the right to vote in 1920, serving as propaganda for the cause while proving to critics that women could be both politically active and great cooks. During the Holocaust, prisoners in the concentration camp at Theresienstadt gathered together to write a cookbook of 70 recipes, “an act of defiance and resistance, a means of identification in a dehumanized world,” according to a review in the NYT. And in The Jemima Code: Two Centuries of African American Cookbooks, author Toni Tipton-Martin explains that as the Civil Rights Movement gained steam in the 1950s, African-American cooks wrote cookbooks to promote ideologies and cultural pride. These gave way to books that celebrated soul food and indigenous African cuisines as the black community fought for visibility and acceptance. Recipes are divided into chapters: “Easy Meals for Folks Who Are Too Busy Resisting to Cook” is full of transportable dishes like spiced mung bean wraps; “Food for Crowds” includes a recipe for coconut milk grits that serves 100; and “Baked Goods + Portable Snacks,” features persistence biscuits and angel food bread pudding with butterscotch sauce. Essays, histories, and resources come from Turshen and contributors including writer Tunde Wey, author Mikki Halpin, teacher and activist Jordyn Lexton, organizer Callie Jayne, and others. Resisting the status quo isn’t new. What differentiates this book from others is that Turshen used her platform (and, she would acknowledge, place of privilege) to convince a major publisher, Chronicle, to bring the resistance cookbook into the mainstream. 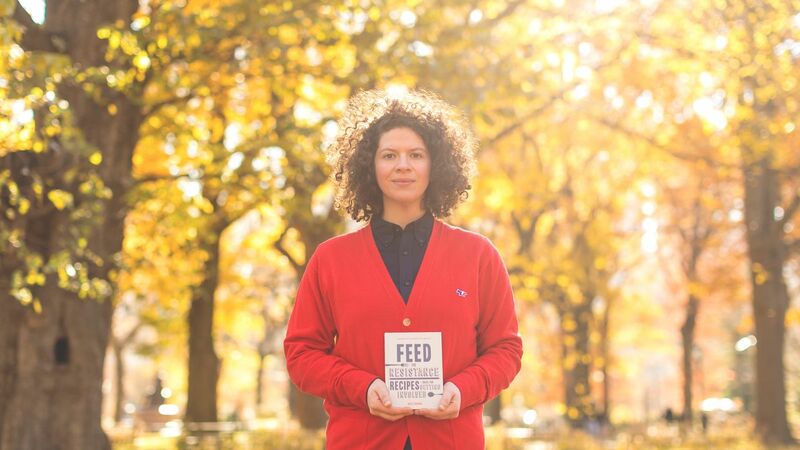 In the process, she’s empowering and inspiring anyone with a kitchen to help feed a movement. Turshen says it was important for the project to directly support civil liberties, too. After publishing costs and contributor fees are paid, all additional sales will be donated to the ACLU. “It was important to me that just buying the book was a way to resist and be part of the movement,” she says. “This book is from a community. My name is on the cover, but it’s definitely not me alone. I think that the collective energy behind the book and contributions themselves make for a sum that’s greater than its parts,” she says. “I’m so proud and excited about the outpouring of support, but this feels like just the beginning.” At the end of the day, Turshen says, “the crucial thing was to make everyday cooks realize how capable they are of giving back to their communities.” Mission accomplished.